The arab Nissan GT-R does some more show off for the spotters in the city centre of London with a crazy (and smoky) drift! The city of London amazes me once again. For a spotter is a city well known because of the many supercars you can find around, expecially during summer. British spotter Richnwilliams has filmed not one, but two Ferrari Enzos driving together! And to make it even more awesome, they're both with rare colours such as the Blue Tour de France and Giallo Modena, just love how do they attrach the attention of the crowd while cruising! Is there anything more fun than a sporty little hatchback? I own the modified version of the Fiat 500 by Abarth which I find extremely fun. Last year I had the opportunity to test drive the RWD Abarth 500 by Aznom-Lucarelli and it was a truly awesome car! 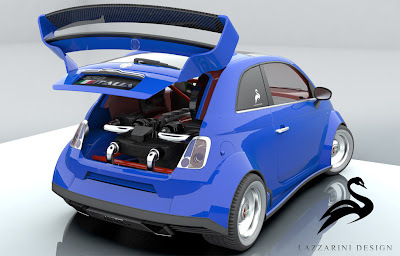 What happend if you put a V8 engine in a little Fiat 500? 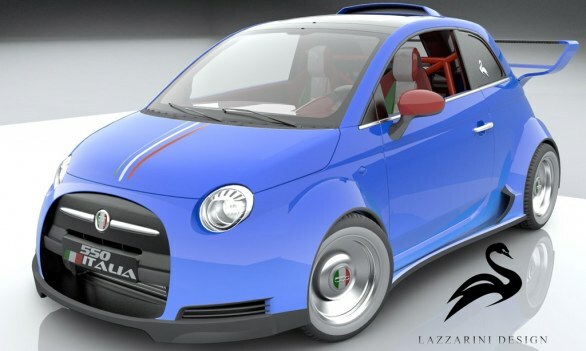 That's the project of italian company Lazzarini that is looking for an investor to help to build the Lazzarini 550, a 550.000$ Fiat 500 powered with the 4.5L V8 taken from the Ferrari 458 Italia but with 20hp less for a better grip and traction of the car (550hp are still enough to move this little car). On the exterior the company has applied a widebody making it 300mm wider in the back and 200mm in the front, the wheelbase has been increased of 300mm. 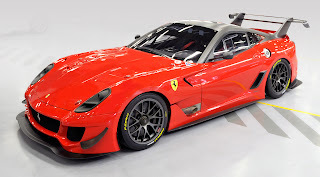 Many components on the car will be taken from Ferrari such as the radiator, suspensions and transmission. Sounds like the recipe for a fantastic machine, isn't it? Just hope the car will become reality one day! The famous, all-carbon Zonda 760RS has been caught on camera driving on the freeway in Chile, just listen to the fabulous noise and the bang while changing gear! Middle East people have a much different taste about cars if compared to ours, and it's thanks to these people that companies such as FAB Design, Gemballa, Hamann are growing over the years, they're able to satisfy the taste and particular requests of arabic people that are the main customers to these crazy and unique modified cars. The following video shows a really unique Mercedes G55 AMG modified by Hamann, is it a fail or not? This accident took place during the 24h of Le Mans (that is not yet over), just watch the unbelievable accident that involved a Ferrari and a Toyota that after a collision it lieterally take off! The Toyota was driven by Davidson that luckily hasn't suffered serious injuries. 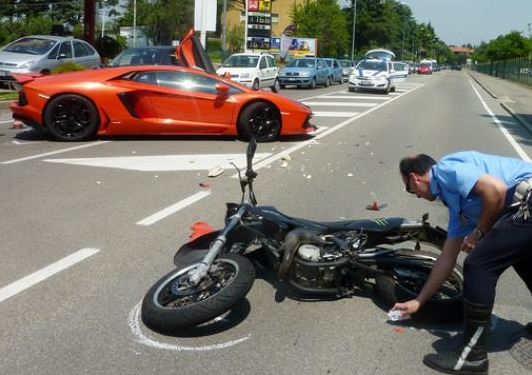 Just a moment of danger, luckily with no injuries or damages. A little unexpected accident while filling up the P4/5 Competizione during the 24h Nurburgring endurance caused a fire, it happened all in just a matter of seconds but thanks to the fast assistance the car was just a bit darker, even the hand of a technician caught on fire but he didn't noticed because it was on his fire-proof suit. I've just stumbled upon a video from the year's Gumball 3000; the Bugatti Veyron doens't attracts for its sound but more for its incredible power and performance. When you see one of these it's produces for sure a feeling of excitement, but this guy in the crowd can't hold his emotions infront of the 1001hp, with a priceless reaction caught on video! Warning: turn down the volume! 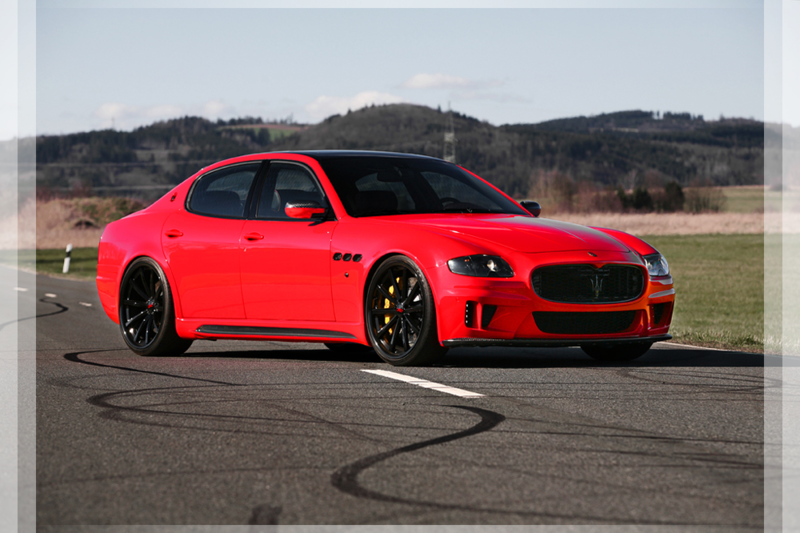 People are talking in these days about the new tuning package to the Maserati Quattroporte that is offered by german tuner called CDC International. Now the italian super-sedan undergoes a massive transformation both in the exterior and interior. In the exterior by the use of new aerodynamic elements such as the new front bumper, a carbon diffuser, the side skirts, 22 inch wheels and a little carbon spoiler. These elements give the Quattroporte a sporty look and certainly doesn't go unnoticed. 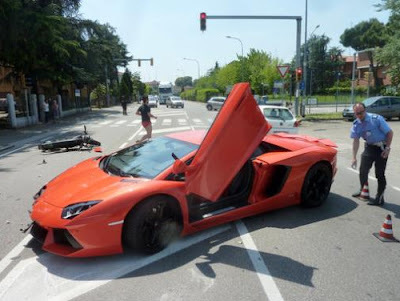 It's not really from today, to be precise the accident took place the 12th May, 2012, I think during the Lamborghini Driver Academy event held at Imola racetrack. Indeed, the accident took place at Imola, not so far from the track and involves a bike, but luckily it didn't caused any serious injuries. The Lambo had just finished to fill up and while going out to the gas station and didn't noticed that a bike was passing. 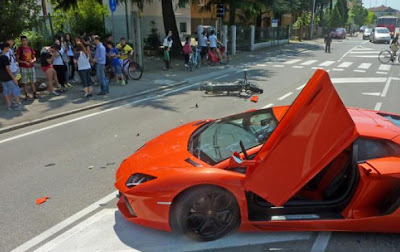 The accident attracted many kids and curious people in the area, you don't get to see quite often an Aventador and even less in these circumstances! The unreal video you're going to watch was taken by the surveillance cameras of a grocery store in a gas station in Istanbul, Turkey. A woman was driving her Porsche 997 Turbo in the gas station and probably, instead of pressing the break pedal she did the opposite (I wanna hope by mistake!) with the result of a sudden fast acceleration that ended by hitting a car, destroying the glass window and the grocery store, luckily with no injuries, probably just a big scare and a huge bill for fixing the chaos she has caused. It's not unusual to match the power of a fast supercar with a jet fighter in an air dragstrip. This time the drag race involves the Lamborghini Aventador LP700-4 and the jet fighter F16 Falcon. As always, the car has a better start acceleration meanwhile the jet need more time to reach a good acceleration... check out the video below and see who's gonna win! The city centre of London is not really the best place to show the power and the noise of a supercar such as the Lamborghini Murcielago LP640. Indeed, in the area of Knightsbridge (where the video was taken), usually many people with their supercars from Middle East love to make noise during summer, and the citizens of that district can't take it anymore. And it looks like that even this guy gets pissed and attacks verbally the driver of this Murcie once he revs for the camera. It's not a new to read on the news about american actress Linday Lohan's excess and accidents. She had multiple times problems with law, drugs and alcohol. 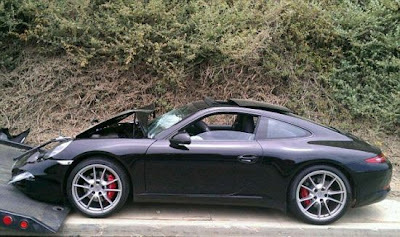 In the past she even crashed her Mercedes SL55 AMG in the streets of Beverly Hills, but the news of today reports that she has crashed her new Porsche 991 Carrera S on the Pacific Coast Highway in Santa Monica into the back of a truck. Lindsay Lohan and the passenger have been sent to the local hospital for precaution though they didn't suffered any injuries, at the contrary of the german exotic. 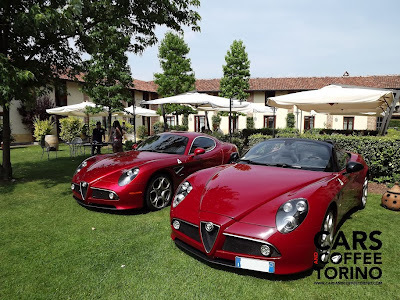 You may have heard that recently the area of Modena has been hit by a series of brutal earthquakes, even the most important factories such as Ferrari, Lamborghini and Maserati had to shut down for a couple of days. It's not a good situation, many houses have fallen down, many factories are damaged and unfortunately there are injuries and casualties. Ferrari has decided to give a hand to the population by doing a charity auction for raising important funds to donate to the parents to the victims of the earthquakes. It's also a very good occasion to do the right thing and give the opportunity to Ferrari fans to buy very exclusive products such as the helmet of Felipe Massa, the racing gloves of Fernando Alonso. Let's take a look below to the hottest things you can buy from this auction. How about time, after the Underground Racing twin turbo Gallardo reached a top speed of 405km/h in Russia, a new creation has arrived: the twin turbo Lamborghini Aventador LP700-4, or now should be called LP1200-4! Now it produces 1200hp and thanks to the 4WD system it's able to accelerates from 0 to 100km/h in just 2.2s! Actually it's the only spec we know about it, but it's sure this monster can reach 400km/h with no much effort! If I had an old and expensive supercar like this I would never burn the tires in this way, but this owner pleases us by doing a few donuts with his legendary Ferrari F40, not a scene you get to see every day. Summer is coming, and even this year we hope to see some action and nice cars coming from Middle East. The following video was taken in Sloane Street (London) where usually most of the spotters are located for filming, you can see an arabic owned (and modified for sure) Nissan GT-R that shows off for the cameras by sliding in the corner. That's a pretty famous corner, me too I managed to film something similar last summer, featuring an arabic owned Mercedes C63 AMG.